Welcome to the Unofficial Elder Scrolls Pages! We have been building a collaborative source for all knowledge on the Elder Scrolls series of games since 1995, and we could use your help! To begin browsing our site, you should select one of the games on the left side menu. If you would like to help us build the site, you can learn how to get started as an editor, read over the help files, or look through our guide to helping out. If you'd like to discuss the Elder Scrolls with other users, please consider using the UESP forums. This site's purpose is to provide information; therefore, most of the content contains spoilers. We are currently maintaining 61,032 articles. The Elder Scrolls Online: Elsweyr is now available on the Public Test Server. The expansion allows players to explore the sands of Anequina, and prominently features the return of dragons to Second Era Tamriel. Anyone who has tested a previous chapter on PTS will have access to the region, alongside anyone who receives an email invite. For the full story, see the official announcement. A new card expansion for The Elder Scroll: Legends centered around the Three Banners War has been released. It includes 100+ new cards, five new triple-attribute factions (Aldmeri Dominion, Daggerfall Covenant, Ebonheart Pact, The Empire of Cyrodiil, and The Guildsworn), new keywords and card effects, a new playmat, visual effects, and music tracks. There is also a new roadmap with plans for the near future of Legends. The roadmap shows another three expansions this year and several tournament events. After the announcement of Leamon Tuttle's promotion to Loremaster for ESO, the UESP got a chance to ask him questions about his work with the game! You can read the interview here. 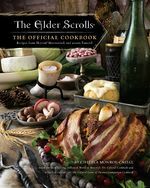 The Elder Scrolls: The Official Cookbook, by Chelsea Monroe-Cassel, is now officially released! Check out our page for it here, and our interview with the author here. Today marks the 25th anniversary of The Elder Scrolls franchise. Following the running tradition from the tenth and fifteenth, the 25th anniversary sees The Elder Scrolls III: Morrowind released for free, for today only. Today also sees the Elsweyr prologue quest release for Elder Scrolls Online players. Additionally, Elder Scrolls Online will have a free play week running from March 28th to April 4th. Furthermore, there will be a general sale on The Elder Scrolls franchise products, with discounts going up to fifty percent. You can get your free copy of Morrowind, and see a full list of Bethesda's related events, here. The UESP got a chance to interview Josh Utter-Leyton, a Card Designer at Sparkypants Studios, about the Isle of Madness story for Legends. You can read the interview here. The UESP has conducted an interview with Chelsea Monroe-Cassel, the author of The Elder Scrolls: The Official Cookbook; we asked about the making of the cookbook, some of her inspirations for the recipes, and more. The interview can be read here. Another sneak peek for Skyrim's Creation Club has announced four new Creations: Umbra, Shadowfoot Sanctum, Arms of Chaos (pictured), and Spell Knight Armor. The sneak peek is posted on the official forums. Update March 14, 2019: These four Creations have now been released, along with several updates to previous Creations such as Bone Wolf and Plague of the Dead which aim to fix certain bugs and further integrate new content into the game world. Invites have been sent for the The Elder Scrolls: Blades closed beta: it is iOS-only, and invites are prioritized by device and by order of early access sign-up. Early Access, which will be open to more users (including Android), is expected sometime this spring. Note that the beta is under NDA, so any information regarding it is strictly confidential. After much anticipation, ZeniMax Online Studios has officially announced the beginning of the "Season of the Dragon". The Season of the Dragon will be a year long story arc revolving around the return of dragons in Elsweyr after Abnur Tharn recruits you to assist him in ending the Three Banners War. This announcement confirmed the next chapter would be Elder Scrolls Online: Elsweyr. 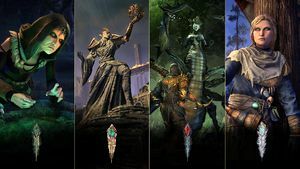 The Season of the Dragon will begin with the Wrathstone dungeon pack, followed by the Elsweyr Chapter, then a currently unnamed dungeon pack, and finally an unnamed story zone. The official announcement can be seen here, and the official trailer can be seen here. 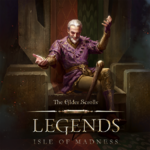 After being announced at QuakeCon in August, the The Elder Scrolls Legends story Isle of Madness finally has a release date: January 24th. In addition to a story to play through, Isle of Madness features 55 new cards, and a new "double card" mechanic. An official cookbook for the Elder Scrolls series was officially announced today: The Elder Scrolls: The Official Cookbook, by Chelsea Monroe-Cassel, author of World of Warcraft: The Official Cookbook. The book features over 60 recipes total, including dishes that have appeared in-game as well as others inspired by TES lore, and it will be released on March 26. The New Life Festival Event is now live in ESO. From December 13th to January 2nd, the event will allow players the chance to obtain various collectibles, including a style motif, hats, costumes, recipes, mementos and a brand new skin. During the event, players can also earn Event Tickets and purchase the final Indrik Feather required to unlock the mythical Nascent Indrik mount. For a full list of available items, see the New Life Festival Event page. For more information, see the official site. After several teasers, the highly awaited Forgotten Seasons Creation has been released for Skyrim Special Edition. It is the largest content update released for Skyrim since Dragonborn's Xbox debut in December 2012, adding a sprawling puzzle-based Dwemer dungeon along with three quests and a host of new enemies and items. Forgotten Seasons is the biggest Creation released to date (to include Fallout 4 releases) and can be purchased for 1,200 credits. It was released alongside five other Creations, namely Civil War Champions, Elite Crossbows, Saturalia Holiday Pack, Sunder & Wraithguard, and Vigil Enforcer Armor Set. The Undaunted Celebration Event is now live in ESO. From November 29th to December 5th, this Group Dungeon themed event will allow players the chance to obtain various collectibles, style pages, costumes, pets, mounts, and even homes. An ultra-rare jackpot prize is also available, which grants 130 mounts at once, including mounts from previous Crown Crate seasons. For a full list of available items, see the Undaunted Celebration Event page. For more information, see the official site. Another sneak peek for Skyrim's Creation Club has announced five new Creations: Civil War Champions, Sunder & Wraithguard, Vigil Enforcer Armor Set, Elite Crossbows, and Saturalia Holiday Pack (pictured). The sneak peek is posted on the official forums. Additionally, a more extensive look at Forgotten Seasons is available in another post, which can be found here. The Clockwork City Celebration Event event is now live in ESO. By returning to the Clockwork City from November 15th to November 26th, you can earn double drops from crafting nodes, reward boxes from daily quests, and bosses. The Clockwork City DLC is also on sale in the Crown Store, alongside a temporary free trial of ESO Plus to access the DLC completely for free. For the full details of the event, see the official announcement. 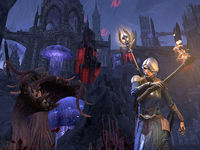 The latest DLC for the Elder Scrolls Online has been released for PC and Mac players. Players can now access a new zone and main questline, located deep in the swamps of Black Marsh. Also included is a new 4-player arena called Blackrose Prison, item sets, motifs, craftable furnishings and collectibles. Murkmire is available free for all current ESO Plus members or can be purchased for 2000 Crowns from the in-game Crown Store. In addition, Murkmire will be available as a Daily Reward during the month of November. Also released today is Update 20, which notably includes destructible bridges and milegates in Cyrodiil, Housing and Editor improvements, alongside numerous smaller bug fixes and improvements. For more information, see the full patch notes. The DLC and update will be available to PS4 and Xbox One players on November 6th. Update: The first part of Loremaster's Archive: Murkmire Q&A has been published. The Argonian historian Jee-Lar answers user-submitted questions about Murkmire and related lore. Update 2: Part 2 of the Q&A is available and can be read here. 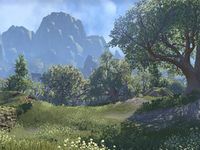 The events for ESO for the remainder of 2018 have been announced. In addition to the usual rewards specific to each event, you can also earn Event Tickets, which can be exchanged for Indrik Feathers. If all four Indrik Feathers are collected, an additional Nascent Indrik mount will be unlocked. For more information about the Event Tickets, read the official announcement. Three new Creations were announced for Skyrim Special Edition in a sneak peek on October 2 and have been released: Bone Wolf, Staff of Hasedoki (pictured), and Wild Horses, first teased back in August. The sneak peek can be found on the official forums. Look for more information on these Creations in the coming days using the links above. The anticipated developer change from Dire Wolf Digital to Sparkypants Studios has begun. The entire client has been rebuilt from scratch, including a new interface, new gameboard, new and improved animations, increased gameplay speed, revamped card frames, new premium card animation, and an improved tutorial. This will be the largest update for Legends to date. No progress will be lost and you can just pick up the game where you left off. The new client will be available as an update to the current app, like previous patches. UESP is busy preparing for this change. You may notice missing card images, but we will be working hard to replace them with versions from the new client as soon as possible! Please post any questions on the Legends talk page. ... that the Skyrim town of Dawnstar was once besieged by Ice Tribes, because Governor Cyril Vinticae foolishly let a traitor infiltrate his court? ... that Imperials were not a distinct race until Redguard? ... that Maormer use the sea serpents of Pyandonea as steeds and warbeasts? ... that Morgiah, daughter of Barenziah, became Queen of Firsthold by striking a deal with Mannimarco, the King of Worms? ... that Malacath was supposedly created when Boethiah ate the Altmeri ancestor spirit Trinimac? ... that Eyevea was a part of the Shivering Isles for thousands of years, because Shalidor traded it to Sheogorath for the Folium Discognitum? ... that in Oblivion Mobile, the Champion of Cyrodiil used Azura's Star to obtain the blood of a Daedra? ... that the Empire had Tsaesci rulers for over four hundred years during the Second Era? ... that each of Elder Scrolls Online's original zones was split into three subzones? ... that the Forsworn captured the Reach in 4E 174 and held it until it was retaken by Ulfric Stormcloak in 4E 176? This page was last modified on 19 April 2019, at 18:21.